Get to know the ins and outs of D3M, from how it works to its main features. 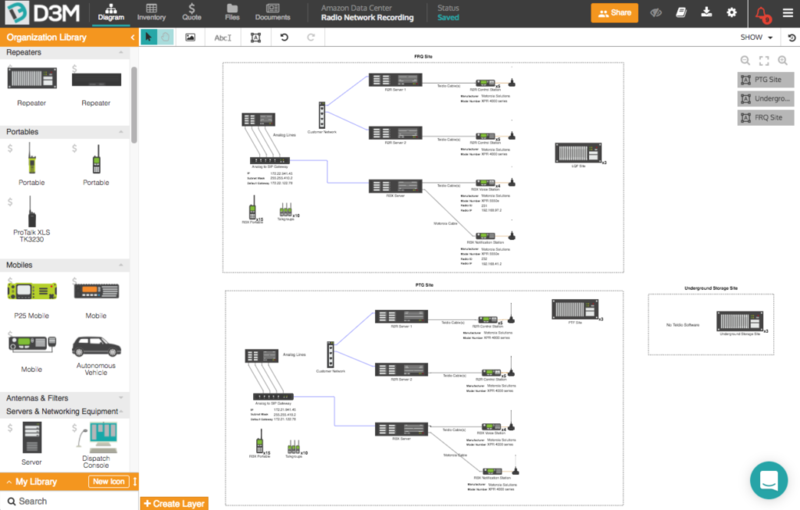 D3M simplifies the process of Designing, Documenting, Delivering and Managing networks. D3M is a web solution created to help you and your team collaborate on network design projects from inception to deployment and post-sales. It was designed to improve your firm’s professionalism, help you build a stronger brand and stand out from the competition; ultimately allowing you to land more contracts, make more money and lower the cost of service and maintenance. It’s easy to use and enables all of your team members to collaborate in real-time no matter where they’re located. Easily collaborate and share projects, via in-app email invite or PDF, and manage editing and sharing capabilities. As you design your network D3M auto-generates the project documents to share with your team and customers. D3M was built with the user in mind, creating easy to use features, such as drag & drop, for easy adaptability. As you make changes to your diagram D3M syncs with every aspect of D3M, for proper data recording. Create a visual representation of your network using icons. All D3M accounts come with default icons and the ability to create custom icons and bundles. D3M is a cloud-based solution, allowing you to securely access your project data at all times, from wherever you are, allowing for seamless remote access. D3M takes the security and privacy of your data very seriously and has several layers of security to protect your privacy and confidential information. Looking for a more in-depth explanation of D3M? We’ve got you covered. As you design your network sit back and let D3M auto-generate your project inventory, quote and sales proposals. When you make changes to your diagram D3M syncs with every aspect of the tool, ensuring accurate data recording. Effortlessly build your network diagram in minutes by simply dragging and dropping icons and connections onto the canvas. With technical and non-technical views, create diagrams in different views that can be understood by all, ensuring everyone is up-to-date. Create document templates, embedded with your logo and company details, saving you time during the final phases of your network design project. All project data is stored in one, secure location, accessible from anywhere at anytime, limiting confusion, duplicates and loss of information. Create custom resources by adding properties, default values, ports & types, which are automatically saved for future access. As you design your network diagram, D3M automatically creates a detailed project inventory that includes model numbers, part IDs and more. Keep all project information in one location. Store and organize important files, like contracts and quotes, accessible anytime, anywhere. D3M offers icons from multiple industry leaders to bring users extensive, up-to-date icon libraries, including ports, properties & specifications. Easily create a professional quote and proposal in minutes. Simply add your logo and company details to the auto-generated quote and proposal. Want to give D3M a test drive? No problem!